Southern Command completely remodels the base's kitchen, introduces far richer, more varied menu. The dining room is a central point in every military base, serving soldiers three meals a day, seven days a week, throughout their entire period of service. The base of the Southern Command of the Home Front Command has taken this fact a step further - and created a dining room the soldiers could never have imagined before. 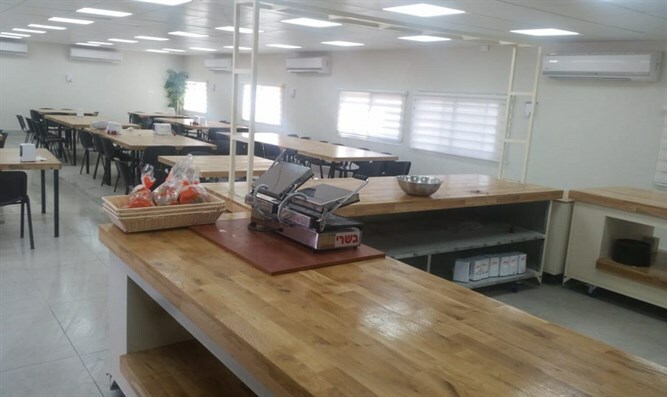 "When we created the sketch of the dining room before we began to sit with the contractors on the renovation process, we knew that the goal was first and foremost to turn it into a kitchen of the [21st century], one that was suited to our soldiers," said Major General Gil Naor, the district logistics officer. "We took out all the furniture and the old dishes, and we changed everything - from the windows, to the cooking utensils and the kitchen to a combination of Jerusalem stone and marble in the serving stations." "The soldiers first eat with their eyes and senses," he added. "The compound is air-conditioned, furnished in a modern and comfortable way. The food is heated and cooled on the spot - the soldiers see that their needs are addressed as soon as they enter for lunch." After the renovations, the dining room at the base became a pleasant place to sit, relax, and even to have fun, and now the time has come to refine the center of attention - the food. "We have added a pastry stand from a professional bakery located in the kitchen, a health corner for soldiers who prefer to make their own salad, and we have spread chef positions in which the kitchen staff prepares different dishes for them - directly and efficiently." "There are a few things that make our dining room different from the rest," he says proudly. "We added shwarma for our soldiers once a week, where they prepared their dishes, different flavors of drinks, and even an ice machine that will be installed in the coming weeks." "In the new kitchen, wedo not leave the vegans and vegetarians behind. We make sure to add vegan and vegetarian options to every meal," emphasized the logistics officer. "From pies to fresh focaccia, no soldier will remain hungry because of his preferences." And, of course, during the time of the holidays, they are also making sure to raise the level of the holiday meals. "In the upcoming holiday of Sukkot, all the soldiers who stay on base will enjoy a rich and varied meal that the head of the kitchen has prepared especially for the holiday, and will be served in the succah adjacent to the dining room." Even kitchen staff conditions have improved remarkably in the district base. "Suddenly soldiers see the kitchen staff enjoying themselves and the joy of the work is felt," said Major Naor with a smile. "Except for the fact that the lines outside the dining room have become long during the day, now even kitchen duty does not look so bad." The food department in the Technology and Logistics Division, which is responsible for all the renovations of the dining rooms and kitchens, also sees the quality, tasty and pleasant response to all the servants, the rear bases and the field, and trains its personnel in a variety of fields and types of cooking. "We fought hard with the commander of the district, Colonel Yossi Cohen, for this move, and we did not give up on him," Maj. Naor summed up. "A soldier who eats well and feels that we are looking out for him will function well, and judging by the number of soldiers and the amount of time they are in the dining room In recent weeks, this feeling has been quite evident."